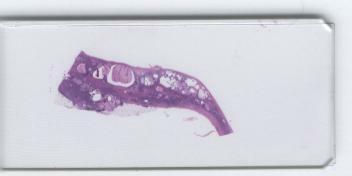 We thank Dr. Carmen Luz Men�ndez, staff Pathologist at Hospital de Cabue�es, Gij�n, Asturias, Spain, for contributing this case. 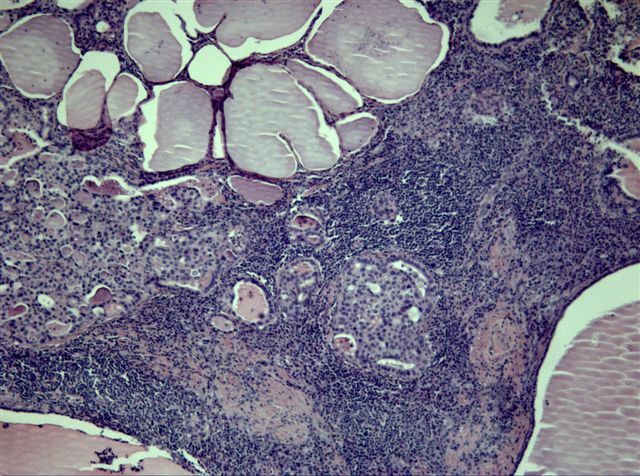 We invite you to contribute a Case of the Week by sending an email to NPernick@PathologyOutlines.com with microscopic images (any size, we will shrink if necessary) in JPG or GIF format, a short clinical history, your diagnosis and any other images (gross, immunostains, EM, etc.) that may be helpful or interesting. We will write the discussion (unless you want to), list you as the contributor, and send you a check for $35 (US) for your time after we send out the case. Please only send cases with a definitive diagnosis. 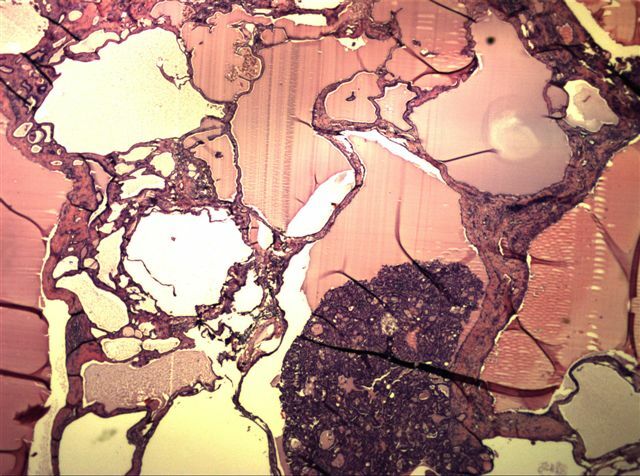 The patient is a 56 year old man with the recent onset of hypertension. Radiologic studies disclosed a large, cystic renal lesion. 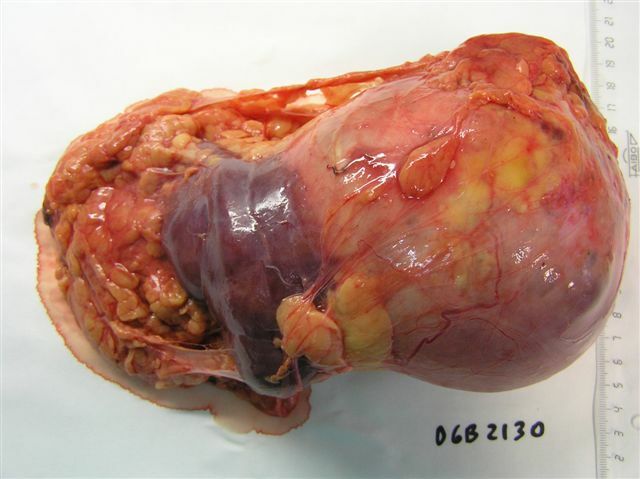 At radical nephrectomy, the lesion measured 11 x 5 x 3 cm, was cystic, and contained yellow clear fluid. It was well demarcated from the adjacent kidney. 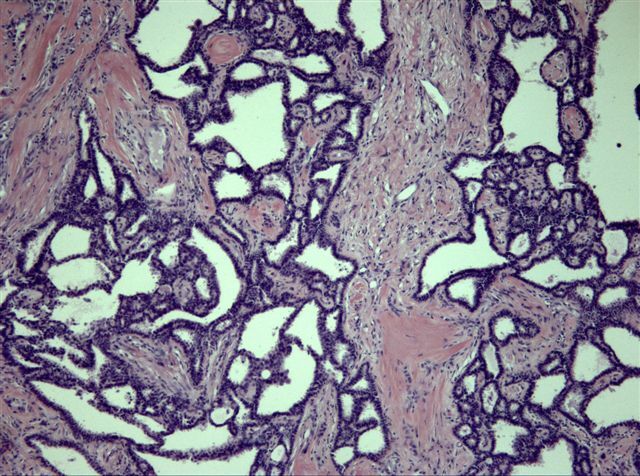 The immunostain for 34betaE12 was also positive. 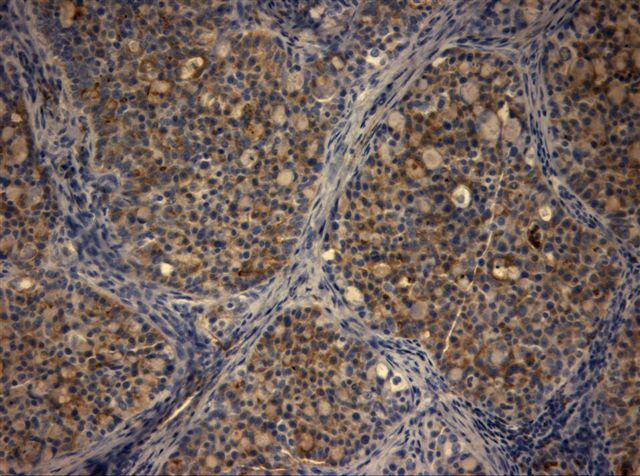 Tubulocystic carcinoma, also called low grade collecting duct carcinoma, is a rare, recently described entity that appears to derive from the collecting duct. It occurs in adults and elderly patients, with no well defined gender preference. These tumors are often incidental findings. They are usually well circumscribed, gray-white and cystic, with a medullary location, and are often surrounded by a rim of compressed fibrous tissue. There is minimal hemorrhage, necrosis or invasion of adjacent renal parenchyma (Urology 1997;50:679). 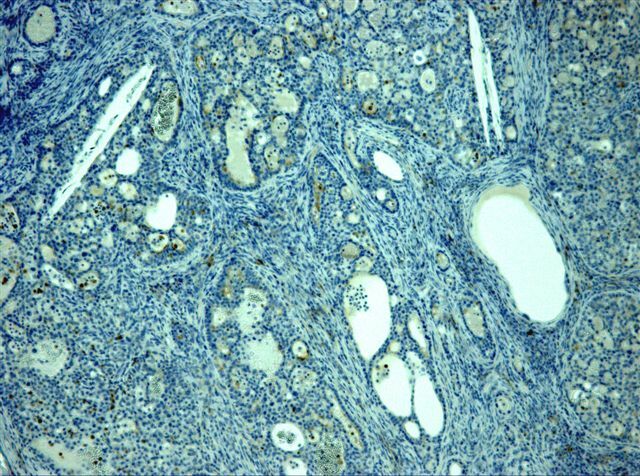 Microscopically, these tumors are composed of tubules and variably sized cysts lined by cuboidal and columnar cells with eosinophilic cytoplasm. The nuclei are uniform and nucleoli are distinct, but the nuclear features overall are low grade. There is minimal mitotic activity, no atypia and no desmoplasia. 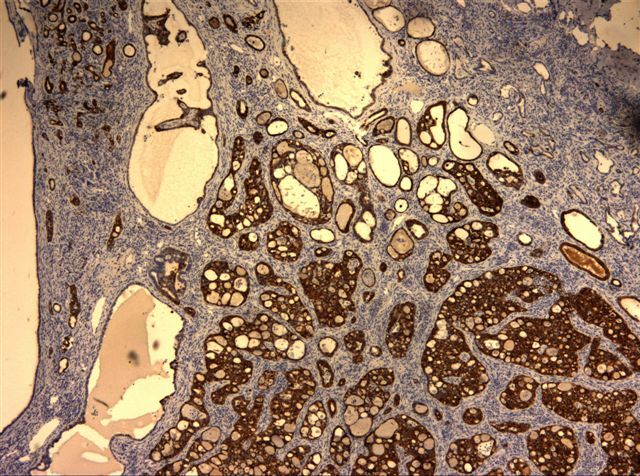 The tumors express mucin, keratins (AE1-3, Cam5.2 and CK19, variable 34betaE12 and variable CK7), vimentin and EMA. There is consistent loss of chromosomes 1, 4, 6, 8, 9, 13, 14, 15 and 22. Prognosis is usually excellent, with recurrences but only rare distant metastases or death from disease. The differential diagnosis includes other low grade renal tumors. 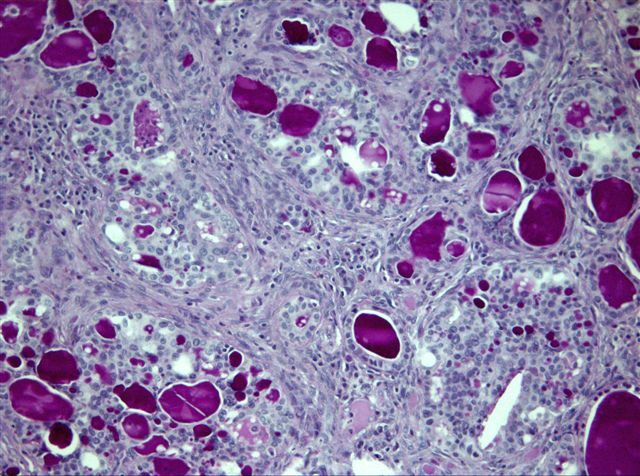 Multilocular renal cell carcinoma has aggregates of clear cells within the septa dividing cystic spaces. 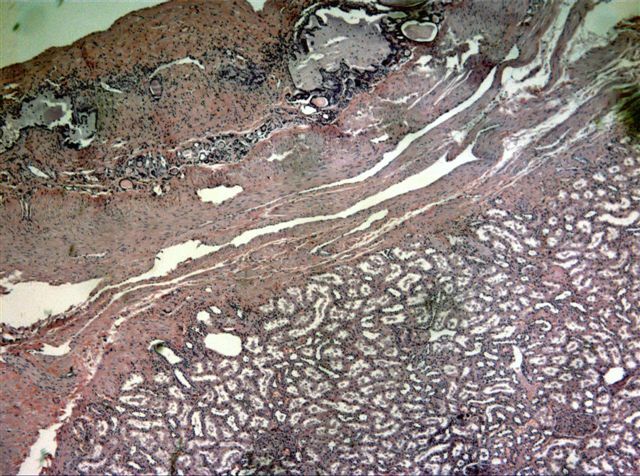 Multilocular renal cyst (cystic nephroma) tends to occur in children under 2 years old and in women ages 40 to 69 years. 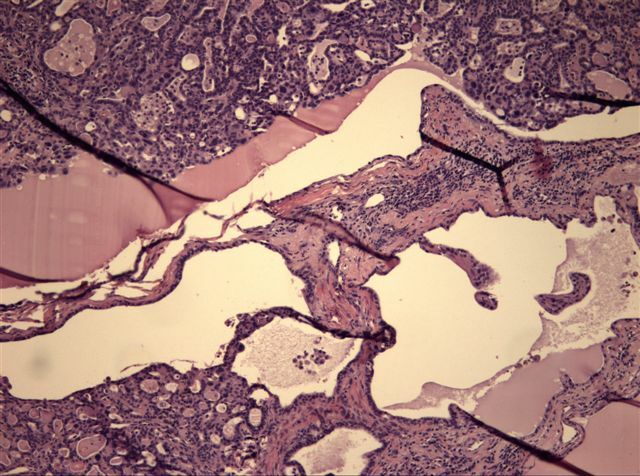 These cysts are lined by epithelium with eosinophilic cytoplasm and a hobnail morphology, and there is often ovarian-like stroma.